Napolean/Continental Freestanding wood stove fireplace blower EP62-M. 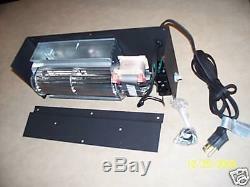 This blower kit replaces EP-62, EP-62-1. The blower is factory equipment from Napoleon. Be sure to compare the dimensions listed, to your unit, to be sure it will fit. The blowers are "contractor kits" with limited instructions. Intended to be installed by a qualified technician. The EP62-1 blower kit comes complete with a variable speed switch that is used to turn the blower on and off as well as adjusting the blower speed. An optional thermostatic sensor control kit, (EP-36) to thermally activate the fan is also available. Includes shroud and mounting hardware. Overall Blower Length with guard: 12.25 in. Discount Home and Garden Products accepts payments via Pay Pal. We accept credit cards processed through Pay Pal. Feedback Policy Your satisfaction is important to us. These charges are the buyers responsibility. The item "Napoleon Fireplace Blower Fan for Wood Stoves EP62-M EP62-1 EP-62" is in sale since Monday, December 29, 2014. This item is in the category "Home & Garden\Home Improvement\Heating, Cooling & Air\Fireplaces & Stoves\Replacement Parts". The seller is "warmerplace" and is located in Ferndale, Michigan.